These lighted houses are brand new and I LOVE them. Three prim houses in rustic colors all together with a star and wreath. BUT.. I got the last two, they are not going to make any more.. and I am really wanting one for myself. Knowing how well these will sell for us I put out my lip and pouted a bit.. but they told me they didn’t love me that much. So, if you like them as well as I do, get in here and take one home before they are gone.. or I take one. These wood wall sconces are also a brand new item from these crafters. We have them paired with coordinating candle rings and a Grungy Battery Operated Taper. We have already sold several of these and they only came in Wednesday. If you are not familiar with our tapers, we hand dip each one three times in beeswax and roll them in a special grubby mix to get the unique texture we have. They will last about 700 hours on 2 AA batteries and we carry them in several country prim colors. Another new item they are introducing are these wood trenchers. 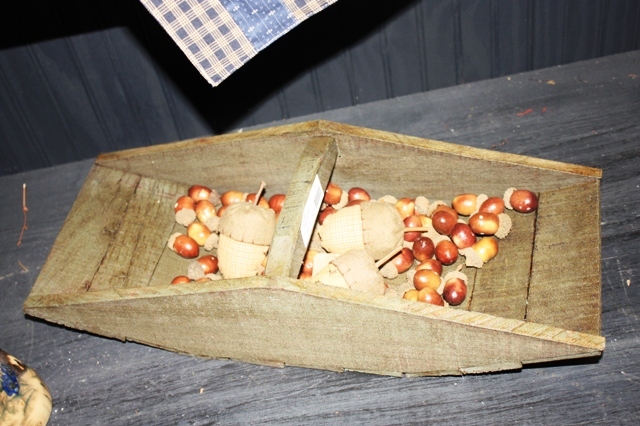 We have them in several colors and they look great with seasonal potpourri and fixins in them. They are also large enough to make a nice centerpiece on a table. Well, the shop is still a mess.. but it is coming together. I have moved furniture and rearranged some things. This is the red cabinet to the right inside the front door. Hard to make out in the photo, but I added a strand of the 140 Deco or Rice Lights. 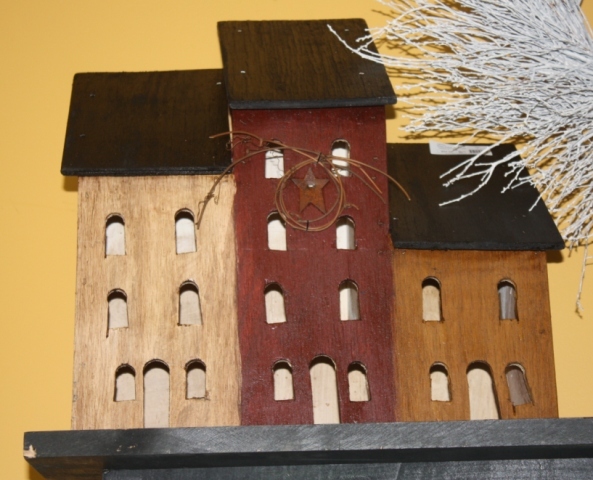 The lighted Church and Prim House are locally made and we are having a hard time keeping them in the shop. In the display are a couple of our newer plates and some of the nice prim fabric stars are stuck in a basket of greenery and in that metal bucket with the fern. These stars add a different texture to the floral elements and are just plain fun. As you come in the front door you will see this. A nice rusty watering can with this festive fern poking out of the top. More rusty pails and an assortment of pansies and berry picks are stuck in them for color. 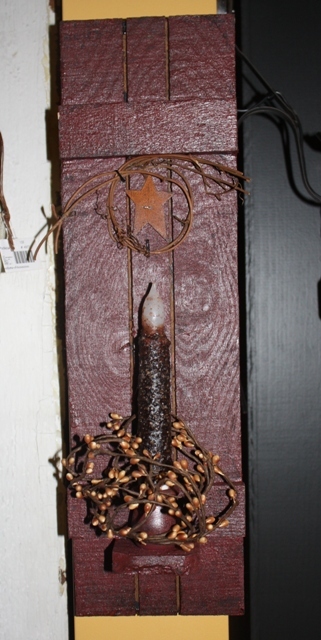 Add a nice Barn Red Star for contrast and you have a nice arrangement for a front porch. This black cabinet also got a makeover. It was pulled out of the corner and put flat along the wall. Another lighted Prim House is on the top with some lush ivy spilling out over a basket. Some nice pictures of herbs and a few plates and crocks round out the display. This is in my Spoon Carved hutch. It has a nice light inside and it shows off anything burgundy very well. This time, I decided to change out the burgundies and add something different. This rustic pot on the left is cool.. dark and great texture. The pocket star has a pip-berry pick stuck in and it is in front of a nice, colorful plate I use as a backdrop to a lot of things because it has so many colors in it. The little blue crock is hand made and the fabric bird is added for whimsy.